One thing I often hear from Google employees is that what's good for the Web is good for the company. The more people browsing the Web at faster speeds with more capable devices, the more people are using Google services and products. Of course, a corollary to this is that even more people will be seeing Google hosted ads and hosting those ads themselves. Last year, Google's Matt Cutts made waves by saying faster-loading sites would gain better results in Google's important search index, and you've seen the Chrome browser team talk about speed being a major differentiator for them. In that vein, today we see the launch of Page Speed, which analyses any domain and provides feedback to help you run even more quickly. The focus is not on total page load time per se, but to eliminate any pieces that introduce latency. Page Speed Online, hosted in the company's Google Labs, looks at content of the Web page, and generates suggestions that could make the page load even more quickly. 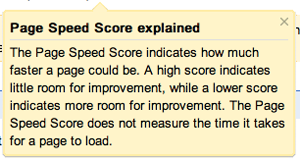 As they explain, reducing page load times "can reduce bounce rates and increase conversion rates". In comparison, TechCrunch received a 70 out of 100, Google gave itself 100 out of 100, Apple scored a 78 and Digg received an 87. Many of the suggestions referred to third party scripts for widgets and other trackers, which are largely out of my control, but there are some helpful tips that if followed could likely take seconds off every page load. To get your site a quick review, go to http://pagespeed.googlelabs.com. Twitter's guidance earlier this month strongly suggested that developers working on their ecosystem bring additional value to the company, rather than trying to compete with them on a dedicated client. While assurances were made to entrenched players like TweetDeck, Seesmic and others that their products were safe, it's come with a subtle hint that Twitter's own applications are not only the market share leaders, but are also the best. But for me, I've not always agreed that's the case. While I rely heavily on Twitter for Mac (originally Tweetie) on the desktop, my choice on mobile for Android (and Windows Phone 7) has been Seesmic - both due to its intuitive and lengthy feature set, but the constraints put on Twitter's own client. Twitter has stated (and likely they've done so rightly) that they want to appeal to more of a mainstream audience - one just coming to grips to a 140-character world full of weird languages that contain hashtags, RTs, replies, lists and other oddities. They also have a business premise of promoting their service as the exclusive place for news and social discovery. This has left an opening, taken by both TweetDeck and Seesmic, to provide a client that supports both multiple services and multiple accounts - on both desktop and mobile. For the power user who needs to use multiple accounts, you simply cannot do that on the official Twitter client for Android today, full stop. And forget about using Facebook, Google Buzz, or any other service. It's not their interest. So I've had to shop around. Since the company's pivot from video comments to major social media client, Seesmic has forged an interesting role of being available on practically every mobile platform and OS, adding Ping.fm for broadcast to multiple services simultaneously, and recently, doubling down on enterprise efforts with early support for Salesforce Chatter and keeping close ties to Microsoft with one-off deployments for the Windows platform. 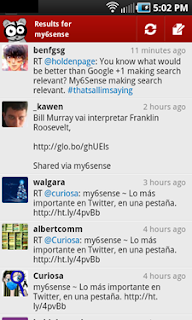 Seesmic first gained praise from me about 2 years ago with the launch of Seesmic Web, which was much more fully featured than the Twitter alternative. 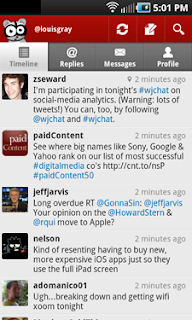 With Twitter having revamped to "#NewTwitter", the gap is less clear, but on mobile, Seesmic still reigns supreme. Having gotten frustrated with slowness, application timeouts and the inability to use more than one account on the official Twitter account, I turned to Seesmic, and the application not only did more, but was faster and extremely stable. No more failed searches and force quits. Beyond the standard Twitter functionality, from timelines, mentions, profile browsing, saved searches and list support, Seesmic's acquisition of Ping.fm means I can post to multiple accounts across services simultaneously, and the services are more than just "check the box" implementations. I was surprised to see how deeply you could monitor fan pages on Facebook, and the addition of Google Buzz support is welcome for me. Amusingly, one of the boons of Android also turned out to be a detraction, for after Seesmic's installation, I would not only receive notifications from the native Twitter app that replies and messages were waiting, but the same activity would double down my alerts, coming from Seesmic as well. 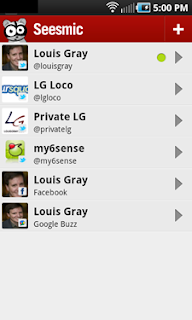 So I did the unthinkable and the official Twitter app is off my Android devices, which eliminates duplication. Meanwhile, on Windows 7, Seesmic was the first app I downloaded, comfortable the experience would be familiar and very useful. To paraphrase the fun line of commercials from Dos Equis, I don't always tweet from my mobile device, but when I do, I use Seesmic. If you need multiaccount and multiservice support, it's the best dedicated client for the job. I even told them so myself for an article Wednesday on the company's blog, one of many folks who told Seesmic why they were the choice. Last week, I gave a presentation at the Kynetx Impact conference just outside of Salt Lake City, Utah, talking with the developer audience about the Third Wave of the Web, and my continued belief that true personalization in both the Web and in our mobile content consumption is what will drive the most dramatic changes to the future of the Internet, following on to the first wave (Information Retrieval and Search), and the second wave (Social Networking). Most directly, I believe that the current approach taken by many leading Web companies, to assume that your friends' recommendations and shares constitute personalization for you, is not enough. True personalization is about your own interests and preferences. The most well known example of recommendation services that rely almost exclusively on your social graph is that of Facebook, where it's generally assumed that if many of your close friends like a topic, that you will as well. My common example is that if your friends like Mamma Mia, it's assumed you like Broadway plays and if many of your friends have given a like to one establishment or another that you would of course be more interested in that. This is extended with tools like Foursquare and others, who give the social connections a big push to bring you new stuff you might like. There's no question that collaborative filtering brings value. But it's not enough. What's more accurate is that you are driven by your own preferences and just because your friends like something doesn't guarantee that you will. Only you have your unique makeup and interests, and the knowledge of how to rank those interests. For example, you may like both Katy Perry and Depeche Mode, and you might prefer Depeche Mode to Katy Perry, or specifically prefer one song of Depeche Mode or the entire album continuous. That's your preference, and what's needed is the ability to learn from your own behavior. The Web sites and applications that do this in the right way will start to separate themselves from the competition. So look at the news just from the past few days. Google is now going to personalize your Ad experience based on your activity in Gmail. That's a good move, based on your own implicit history. But in parallel, we have more chances to tap social signals with +1 in the search results (for starters). At my6sense, we talk a lot about the best signals to watch for to deliver a real human experience that's personal. And it takes more than just collaborative filtering. See the embedded presentation to see just what I mean. Disclosure: I am vice president of marketing at my6sense. I was not compensated by Kynetx for my presentation, but they did cover expenses for the trip. This morning, Google is introducing a new feature within the company's search results aiming to provide social recommendations to one's extended connections. The +1 feature lets you tag results and Web sites you find valuable with the expectation that friends of yours see your +1 and can take that into account when making a follow-up decisions. At first glimpse, this doesn't appear to be too dramatically different than previous attempts to show intent, with starring results, social search and other methods, but one can see where +1 is landing to hint at the future of the program. 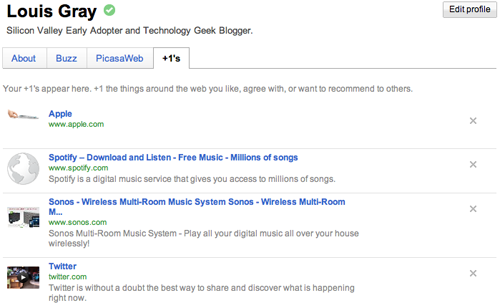 In the company's introductory blog post today, Google talks about sharing recommendations with the world. The idea is that if you find a result you like in search, just hit +1. Theoretically, follow-on searchers will see the right recommendations at the right time in the right format. So who are your friends and how do they see your inputs? Well, for starters, they are looking at those people in your Google social graph, including chat friends and contacts. The company hints at using connections from Twitter as well, notably excluding Facebook, who hasn't historically wanted to play nice with Google in sharing data. The +1 data is also closely tied to your Google Profile, which is a sibling to Google Buzz, which also has following and friend-like attributes. "Soon you'll be able to +1 more than just search results. You'll also find the +1 button on sites across the Web, making it easy to +1 pages after you've visited them. The Web's a big place. Sometimes it helps to have a tour guide." 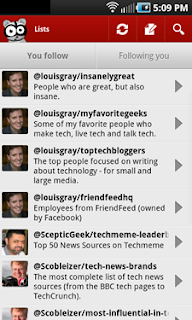 This makes it sound more like a Delicious-style bookmarking tool (outwardly facing) than a RT-style Twitter endorsement. So where do these +1's go? Well, they're immediately posted to your Google profile, in a tab that you can make private or public. Says the dedicated site: "Your +1’s are stored in a new tab on your Google profile. You can show your +1’s tab to the world, or keep it private and just use it to personally manage the ever-expanding record of things you love around the web." You can start seeing the +1 button on Google search results now by signing in to the search experiment in Google Labs. More detail on the +1 button is now available on a dedicated microsite. I would assume we might start seeing "+1" buttons all over sites that want to get more Google juice from social recommendations soon. You can find all my +1s here: https://profiles.google.com/louisgray/plusones. Ever since I gained early access to Spotify in late 2009, I've practically abandoned iTunes for purchasing music. A once-addicted iTunes user who racked up thousands of paid downloads, the only time I ever launch the multipurpose entertainment application these days is to synchronize iOS apps to the iPod Touch, or do a futile search of its TV library to see if Season 5 of Dexter has shown up (it hasn't). But with the widespread expectation that iTunes will eventually launch in the cloud alongside a streaming subscription option, the update has the potential to directly take on Spotify before the fledgling service gets its US land legs, leaping well ahead of Rdio in brand recognition, and doing battle with the still unavailable Google Music - whenever that arrives. For digital music connoisseurs, the benefits to all these interesting players vying for our business is that we will have more sources for good content on practically every device, and for the most part, at prices that make sense. The availability of competition ensures market rates will be driven down to the point of affordability for most, especially the ardent fans who absolutely "must" have every new album from favorite artists. That the companies are taking different approaches to the market also ensures we'll have a choice of how we want to consume our music - mobile, desktop, a la carte, subscription, or any other way. iTunes' market weight is tremendous. It has been widely rumored they are using their muscle to scare labels away from joining forces with Spotify, withholding artists' positions on highly visible pages within the store that have significant impact. The service, once spartan in terms of catalog, has grown to carry both new releases from practically everyone to deep catalogs from those long since gone. But in the 8 years the store has been open, a few things have been consistent - including the idea that customers want to "own" their music, not rent it, and subscription plans are nowhere to be seen. This has led startups like Spotify and Rdio to become more fashionable alternatives to savvy listeners - and these listeners are both loud and loyal. One of the most impressive things about Spotify has been my ability to search for practically any song or artist and find the right answer, often along with a number of remixes for the specific track, or inclusions in compilations. Searching across Rdio shows that in most cases, the catalog is on par with that of Spotify, which makes sense if both firms have executed deals with the same music labels. Spotify seems to have more older albums from artists, and doesn't suffer from restrictions I often bumped into with Rdio regarding availability of full-length streaming in my region. In order for iTunes in the cloud to compete, they need to debut with their full catalog, not a trimmed version of options (like they did with the Apple TV 2). If I see a new album is out from my favorite artist, my first stop is to find it on Spotify. If it's there, I can be streaming the new album immediately, or saving it to my playlists. I even have a playlist just for new albums, so I can add entire albums and delete them after listening to the tracks enough times. iTunes will need to match or exceed the speed of competitors to make the service my first stop. It sounds silly to mention this for the company that brought us the iPod, but for iTunes to be a win for me again, it needs to be cross-platform for mobile operating systems. 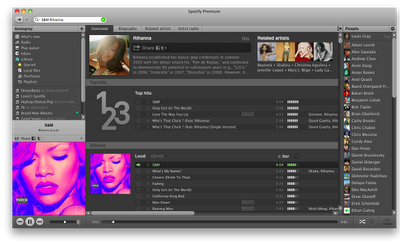 Spotify is available on both iOS and Android, while Rdio is developing for iOS, Android, Blackberry and Windows Phone 7. What do you think the chance is of iTunes coming to Windows Phone 7 soon? 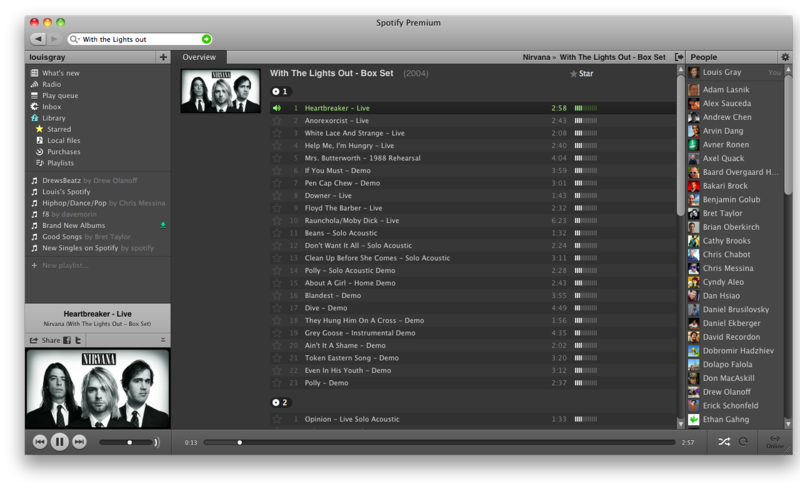 Once a song is streaming on Spotify, it's almost magic to click at any point in the song and have it pick up. After so many different services lag after one moves within the song, the instant gratification is welcome. 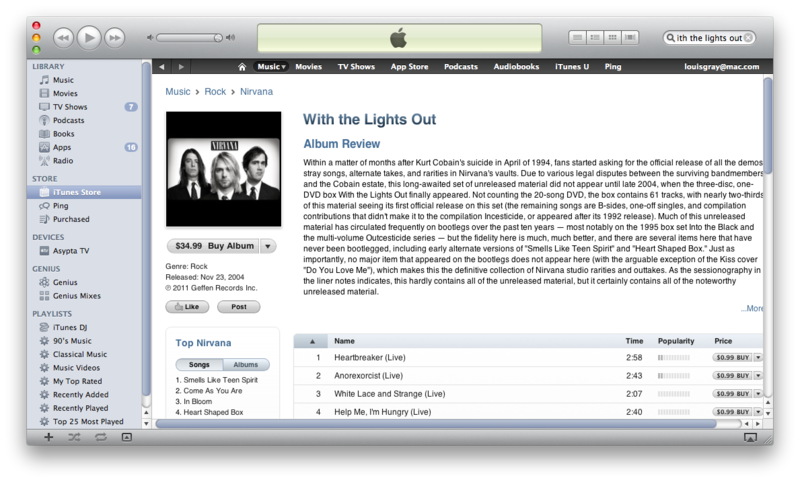 iTunes has always had high quality with the service being download-centric, and I would hope their cloud could keep up. Ping is not the social network where I want to share my music, and it absolutely is not where I want to share my playlists with friends and discover their music. The smart thing would be to stick with what you know best, and pick the leaders for the rest. Spotify integrates with your Facebook social graph to show fellow users, while Rdio lets you find friends on Facebook, Twitter, and a host of email providers. Of course, sharing songs, artists and playlists to social networks like Facebook and Twitter, or by email, would be a prerequisite for a service like this. Enter your social credentials once, and go. One weakness to the online music game is discovering new music and artists. If you've gone fully digital, related artists and music will be increasingly important, contrasted to the old days of trusted DJs and radio stations. Without strong discoverability from accurate related items and social clues, the digital music space becomes a broker of sorts, where users get what they look for, but little more. 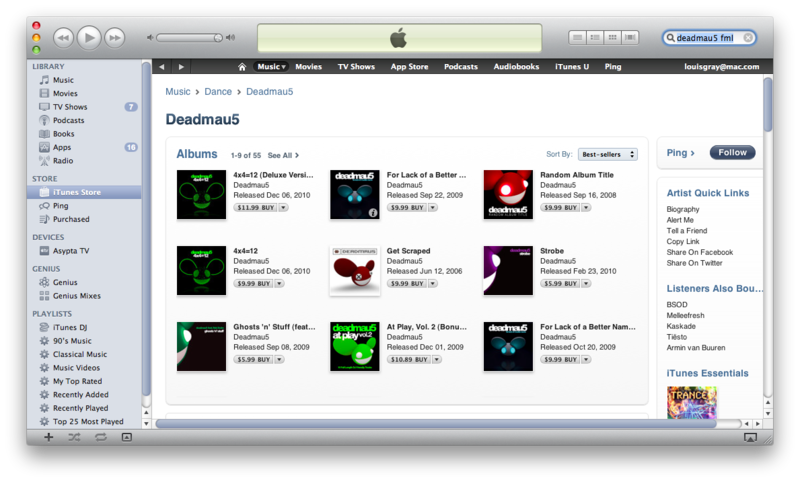 One concern with iTunes here is the division between discoverability and highlighting artists driven by business deals. If you are a paying subscriber to Spotify, you can download playlists so they are available to you in offline mode. 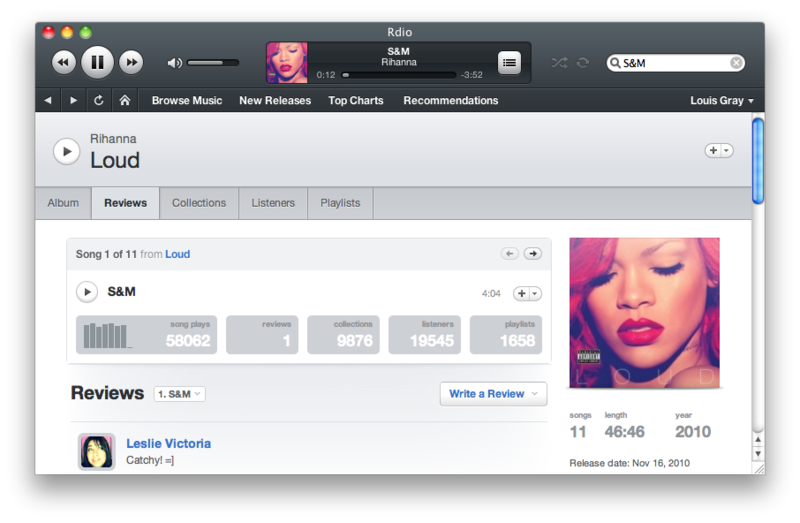 While iTunes has long held to the download and own mantra, this should not change dramatically with streaming. I should be able to download songs to my PC or my phone with no problem, with appropriate DRM. If iTunes can deliver feature-equal functionality to that of Rdio and Spotify, with the same catalogs and pricing, it's probable they will remain the market leader thanks to their massive headstart, software downloads, and access to users' credit cards. Even if they debut something that's almost as good, that would be good enough for most iTunes diehards. What concerns me about iTunes in the cloud, more than pricing issues or flexibility of devices, is them potentially using their market muscle for exclusives that hurt users. For as much trouble as the Beatles deal was, it's no surprise they're iTunes-only for now, but I don't want to start hearing more and more artists saying they are sticking to one digital music store. For Spotify and Rdio, looking the giant in the face, they've got to go big quick, for streaming and a deep catalog alone cannot make them the number one player against somebody like Apple, who is bound to catch up. As for Google Music, like many of Google's products, they have to clearly communicate why cloud is better this time. Just because something is cloud-based doesn't always make it more desirable. Google will clearly have direct access to Chrome and Android users, which gives them a market, but they too will have to do more than hold serve. 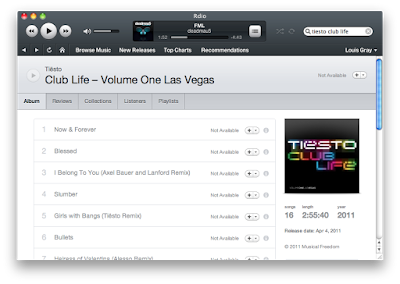 I'm not an iTunes music customer right now. I pay for Spotify Premium, and have paid for Rdio the last few months, though I'm closing the pro account today thanks to its clear overlap with Spotify. If iTunes walks into this space like a bull in a china shop, tossing out new proprietary protocols, higher prices and exclusivity of artists, I'll stay away from iTunes, even on my Mac. But counting out the market giant is silly. I am rooting for Spotify and Rdio (and Google Music) to hurry up before the iTunes Cloud behemoth arrives, but rooting for quality music, fast access and great social links across all platforms, and we should all realize the unsung big player in this space is Facebook. If they choose Rdio or Spotify as their market partner, that would change the game - or they could be yet another player. WB explains the move as an expansion of a test, and in this array, the titles are expected to "appeal to a broad audience, said Thomas Gewecke, President of Warner Bros. Digital Distribution, in this evening's press release, highlighting the popular fan pages for Harry Potter and Inception in particular. 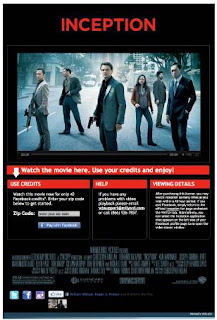 As with "The Dark Night", Facebook viewers who do purchase the movie rentals with credits can see the film for up to 48 hours after purchasing, with standard Facebook stream activity, such as comments and status updates, being available. So far, the tie-in has yet do offer a movie I want to see that I can't already get from Apple TV or Netflix, but assuming these tests continue, just maybe we'll have another alternative in an interesting place. If you're Facebook, you just might put a "Like" button on it. Facebook Notifications from Chrome, Using "What's Up!" For many people using Facebook, the first thing we look for is whether activity has taken place on our wall, or if discussions we've participated in before have attracted new comments from our friends and our friends' friends. It's this Pavlovian need to get feedback and reinforcement for our updates, our shares and our photos, to be part of a continuing conversation. But there's no need to be visiting Facebook.com every couple minutes to see activity. 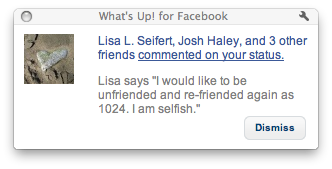 A handy Chrome extension called "What's Up" watches Facebook so you don't have to, pushing notifications in a small window on top of your browser, where you can rejoin the conversation, or simply dismiss. Notifications of activity on Facebook can travel to your e-mail or can be pushed to your mobile phone, but the latter doesn't contain a link to the source, simply saying action took place. With "What's Up" for Facebook, you get a link, who posted the update, and the item itself, such as the comment. It's a lightweight way to stay on top of activity on Facebook without having to contribute to the many minutes (or hours?) a day you already spend on the site, and still be in the loop. The notifications are simple, and come to the front of your screen, no matter what app you are in. So long as you are logged into Facebook and Google Chrome is open, you're good to go. You can find the extension by visiting the Chrome Web store. 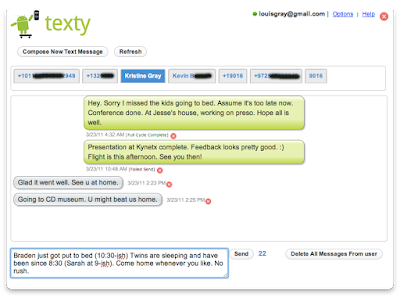 To hear some people tell it, the hot new thing in 2011 is the battle for the hearts and minds of group texters everywhere. With the successful sale of Beluga to Facebook, news of Yobongo scoring more than a million in angel funding, and larger rounds by others including GroupMe and TextPlus, you can forgive people for skipping over the lean Fast Society, who has so far stayed away from VCs, gathering just over $200k in funding, and only counts four employees. But despite their being small, they talk a big game. I took a call with company cofounder Matthew Rosenberg earlier this week, and he, without so much as a filter, told me why he feels the industry is fragmented, how every other challenger is going at the problem wrong, and how greedy carriers (such as Sprint) are harming the entire industry. Fast Society, from much of the coverage I've seen in other tech blogs, has often been characterized as being aimed at socialites, as much about the flashy lights and party-goers as the code - celebrating a good night out more than good syntax. Rosenberg certainly didn't disagree, not shying away from the label, explaining that the service at its foundation was aimed to "help people, when they are going out with their friends, to experience great things around fun events." For him, much of a shared event is not just the actual activity, but the buildup to the event, and the shared emotions associated with the location and experience. "Everybody else is going for the dirty engineer feel," he said. "We are going for what everybody else wants. Fun and parties and nightlife. That's what normal people do. People don't sit around their computer blogging all night. We have tried to be focused on people who aren't necessarily early adopters who don't care about engineering." Shrugging off the comment about nocturnal blogging being abnormal, which I obviously disagree with, I asked him how he thought so many different players could participate - and whether users were tired of seeing their social structures split, much like the early days of IM, where AOL users couldn't speak to those on ICQ, MSN or Yahoo!. Unsurprisingly, he had a response all queued up. "At the end of the day, there's going to be a reckoning," he said. "The fact these things can't communicate hurts the industry. It's so fragmented. Nobody is going to own the communication layer. It's too crowded." With the crowding comes a seemingly unending stream of news from one company or another. On the heels of SXSW, where many services, including Fast Society, stepped up their game in a war for visibility, Rosenberg said that particular aspect of the service was not groundbreaking. In fact, he practically dismissed it, calling it a "utility", adding there's "no magic behind it". Fast Society instead wants to offer not just group texting, but location sharing, instant conference calls, pictures and video - and unlike practically every other vendor, Fast Society does not use third party vendor Twilio as its back-end, saving the company significant charges on SMS, he explained. In the group messaging space, TextPlus is both the pioneer and the alpha dog in the hunt, with practically every other service having sprung up in the last twelve months, some to more success than others. Fast Society was launched in September of 2009, focused on building the platform that would enable them to scale without drowning in a sea of red ink, Rosenberg said. "We're the only ones that I know of who don't pay per message," he explained. "We have a flat fee. What our competitors pay in half a day, we pay for a year's worth of messaging costs. It's a big competitive advantage for us". In a build first make revenue second world, Fast Society seems odd in that they've actually executed real business, striking deals with MTV, and other small sponsorships - which Rosenberg attributed to delivering a compelling experience and providing value for a clearly-targeted audience of teens and 20-somethings out to have a good time. He railed against the industry's tradition of giving value away for free, and being drawn to in-stream advertising like a moth to flame. "It is not pleasant, and not something people want," he said. The company's image of fast fashion party boys drinking and dancing the night away, augmented by the bright purple and sharp angles of the company's logo and product, may make it seem aloof or too focused on hipsters to be a real business. But Rosenberg almost claimed the opposite, saying "we have the most soul in this space," and railing against the relative dinosaur carriers, like Sprint, who is trying to charge for anybody sending SMS messages to their system, upward of a half cent more per message. "It's disturbing and harms the whole industry," he said. "It's just a nasty thing to do." If there is a reckoning in the industry, with one or two names ending up winners, others pivoting and fading, Fast Society is going to make pushing to the finish line interesting. Maybe they're the black hat in the fight, or the white knight trying to save end users from a sea of boring apps. Rosenberg may have thought he caught me on a tired afternoon stuck in an airport terminal on the way to an event (which I was), but he still managed to make a good case for why Fast Society is in the game, and why their lean approach targeting real revenue could keep them ahead of others. You can find Fast Society on iOS or Android, and at FastSociety.com. The sign on the door says they're "Built to Party," so go have fun. Curated news sites are so prevalent, it seems practically everybody has one. With simple tools like paper.li and others, you can even have them automatically generated from the social connections you have on Twitter and other networks. But there's still room for ingenious alternatives that play with highly visual layouts, filters, search and personalization. It looks like we're close to having a new one on our hands with the imminent launch of Cliq.ly, currently ruminating at the longer domain of http://gocliqly.com/, which rolls out top tech news in a tiled format, searchable by keyword. While that in itself is interesting for fast browsing and article discovery, the service teases with a not yet active menubar for "Popular Scenes", "Views" and "Account", which theoretically lets you select your own keywords, sources or other tweaks that would let this potentially become your start page, providing an alternative to the more traditional RSS reader. If you visit the incubating http://gocliqly.com/ now, you'll see graphics from top news sources showing updates on Web services, browsers, and gadgets. 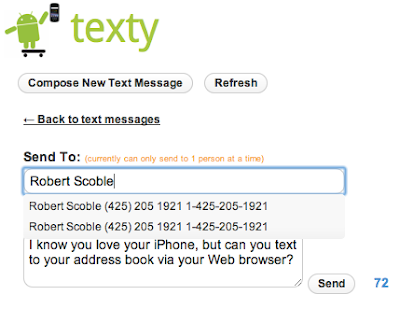 A small textbox lets you filter by keyword, be it from the article's title, content or tags. I tried searches for many top tech terms, from "apple" to "google", "Android", "t-mobile" and blogs like Engadget and TechCrunch, all of which returned multiple results, clickable to the main original link. 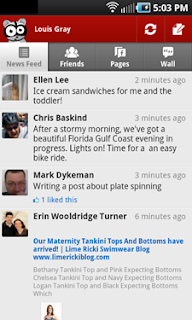 One assumes that as Cliq.ly gets built, one get the opportunity to tweak views to be more graphical or less so, depending on one's preferences. Given the option for "Popular Scenes", it's possible you could create a personal scene with customized feeds and views and save it for others to view. But it's early days. In fact, DomainTools suggests Craig Condon, one of two behind the project, just snagged the URL yesterday. He mentions a designer, Tim, as a partner on the site, but he is providing the majority of the code. What we're seeing from Cliqly on day one is a sneak peek tease of what's to come, no doubt, so bookmark this one, and watch the work develop. Twitter's direct messaging system is an easy way for two people to engage in back and forth discussion through the site, but the serve and volley type of chat is a far cry from real-time, and doesn't allow for broader group chat. Today, Joint, brought to you from the team behind LazyFeed and LazyScope, is launching to bring the flow of instant messaging and semi-persistent chat topics to your existing Twitter social graph. 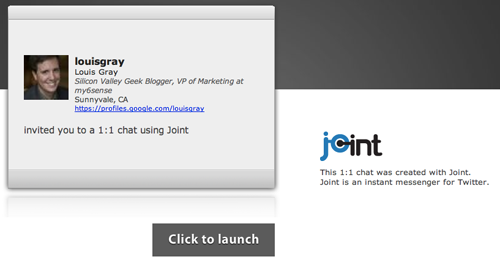 You can get your exclusive invite by posting a comment or by following @imjoint on Twitter. With group chat applications on mobile being all the rage, the desktop experience has been somewhat forgotten, but a dedicated app presents the best keyboard and CPU cycles to avoid any latency between updates, argues founder Ethan Gahng. And once you've tried Joint with a friend or two, you can see how fast you can go from the ping pong manner of DMs in Twitter to real, instant, conversation. You first get connected with Joint through getting invited by a friend through a dedicated, personal, URL. (Such as this one) You are then asked to download a small Adobe AIR client that runs on multiple platforms, and near instantly discovers your Twitter social graph, letting you have real-time chats with people to whom you are bidirectionally connected. This way, all of those with whom you can send and receive DMs can also chat with you in Joint. 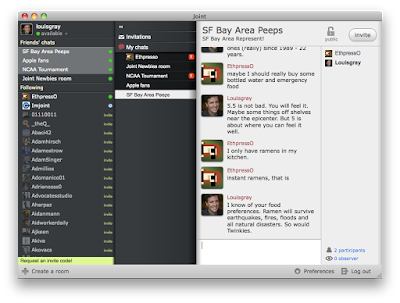 If your friends are using Joint, public chat rooms they have created are displayed in the left sidebar, so you can pop into any chat room and start talking with those who are there. 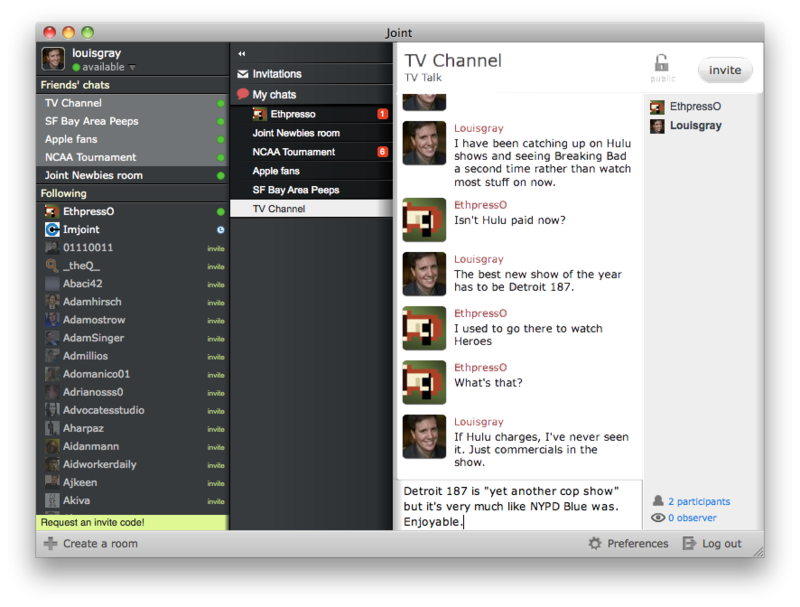 It's a lot like Convore, but on the desktop, and designed as much for 1-1 communication as for static topic chats. 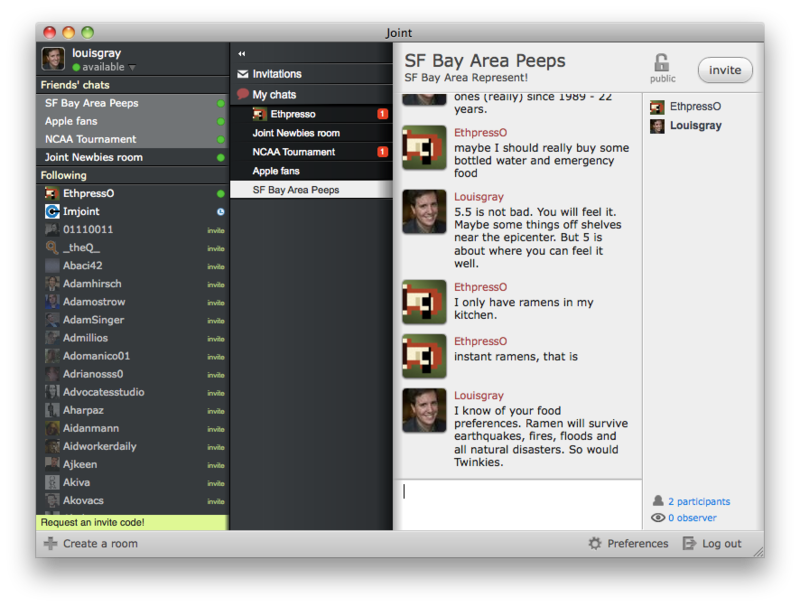 In fact, the chat rooms in Joint are set up so that new users who join a room don't see previous entries. Magically, if every user leaves a chat room, it too disappears, so don't be surprised if you set up a popular room more than once. 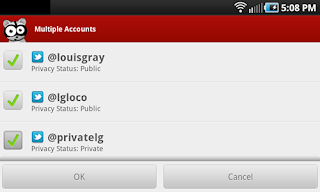 What makes Joint even more like the well-known world of instant messaging (IM) is the idea of status indicators. A green status bubble means you are signed in, while a clock shows you are idle. Once in, you can create a room with any topic, or invite any of your friends to join you. You have the option to create the room with three types - Public, Protected, or Stealth. Clearly, public rooms are open to all, protected means the creator requires a password, and stealth rooms are not displayed at all - even to friends. To get into a protected room, you must be invited, or enter the known password. Stealth rooms even feature a cool stealth bomber icon. 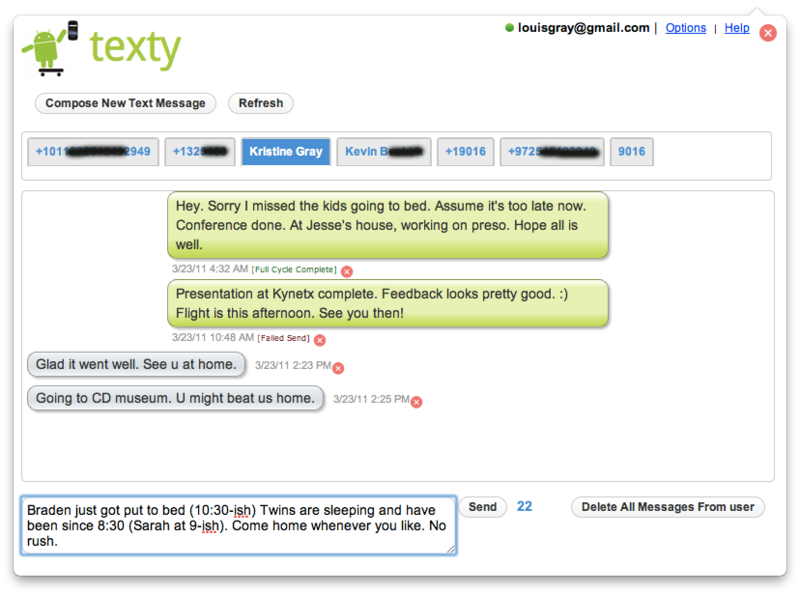 Before you shrug off Joint as "yet another chatroom" service, think of using this first to replace those back and forth DM sessions you've no doubt had with friends, and then think about starting real group chat with your Twitter social graph. Want to get in? Leave me a comment, and follow @imjoint on Twitter. This one's a keeper. 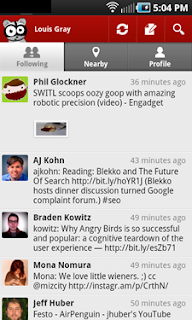 Twitter's relationship with developers and users has been bumpy, to say the least. The users are fiercely loyal about the service, but like Facebook's fans, every little update is first dissected, then railed upon and is typically finally accepted by the community. For all the tumult over client changes, ad inserts, new retweet styles versus old and Web layouts, users have stuck with Twitter without leaving in mass numbers for an alternative. Among the most controversial choices was the company's move to hide tweets aimed at users that you were not mutually following - meaning @reply tweets sent to a third party you weren't already following were simply hidden outright. While the initial outcry was strong, and continues to get mentioned as decreasing Twitter's potential for serendipity and discoverability for new voices, I have found the value of the tweak has enabled real conversations in the service that would be a challenge otherwise, and by making replies a major part of how I use Twitter, there has been no backlash in my own increased use, if one assumes follower counts are a valuable measure. My initial usage of Twitter was extremely cautious, as I knew every single 140 character missive was distributed equally to every potential follower, not to mention redistributed to networks aggregating my content. If I wanted to reply to another user and comment on a subject, I was effectively CCing the entire world, who would have to attempt to piece together what I was replying to, and many more would often jump in mid conversation. It was a mess. While, yes, my connections could see new user names they hadn't previously encountered, plucking quality from the real-time stream in this mix of discussions was a challenge - and I didn't want to add to the noise. In May of 2009, Twitter made what they called a "Small Settings Update. Anticipating a response, the post said "Despite this update, you'll still see mentions or references linking to people you don't follow", assuming the users were mentioned mid-tweet. A follow-on post revealed one of the major issues was technical, that Twitter had to make changes due to continuing scale problems. Eventually the company had to do a mea culpa, not just around the issue itself but in terms of how it was communicated. Users were very frustrated, and the "#fixreplies" hashtag dominating most streams. But in the ensuing two years, as the dust has settled, users, myself included, have learned how to leverage the new environment. For every user out there who adds a stray character (usually a . or a *) before replies to extend the visibility of the update to the community, there are many more who use the system as it was intended. Now, conversations between users who are not mutually followed don't clutter up the streams, and there's a lot more freedom to reply without creating so much noise you have to be ignored or unfollowed. Meanwhile, if a third user has already elected to follow both of you, they can watch both sides of the conversation, and likely have an interest in the discussion. In the last few months, I gave up on being overly concerned about flooding my stream with @replies. 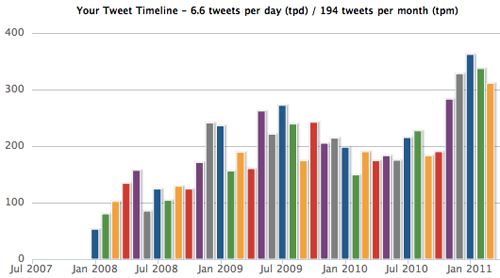 A cursory glance at TweetStats showed @replies had ballooned from single digit percentages of my updates to more than half in 2011, and leading to record quantity of updates, even at times approaching 40 tweets a day - which for me is fairly voluminous. And yet there's been no outcry or massive unfollowing. The numbers aren't accelerating, but we all know the numbers are immaterial and the time for exponential growth is past. But while in the past conversations were practically impossible in Twitter, moving to other platforms, the @reply change made the service a lot more capable to handle deeper exchanges. While the initial reasons for the @replies change may have been steeped in scalability problems and strained architectures, users have adapted, and helped to morph the network into less of a simple status update repository and link bombing channel to one of real back and forth discussion. It's let me talk privately in public. TechCrunch's Sarah Lacy practically writes an epitaph today for Digg following news that the company's cofounder Kevin Rose, the face of the company since its inception, had resigned to pursue a new and unannounced startup. The backdrop of her story is a detailed article she wrote on Rose and the Digg phenomenon back in 2006, when she, then writing for BusinessWeek, placed Kevin on the cover with a youthful grin and headline blaring how he was worth $60 million. Almost five years later, Digg is an also ran in the Web news influence space, outpaced by real-time social media tools, and traffic was noted to be trending downward for years. The story, whether it has a happy ending or a crash, epitomizes the short-term paths to success or failure for many Web startups, who expect to launch loud, grow fast, and make it big - often in less time than a single presidential term. That Kevin had shifted priorities away from Digg some time ago was no secret to those who watched. His investments in a wide array of leading Web companies, from Foursquare and Gowalla to Dailybooth, SimpleGeo, Square, Facebook, Twitter and more must have other angels salivating. His Twitter profile was recently reprioritized to read, "Tech angel investor. Founder of digg.com, wefollow.com." And one can't fault him. As any startup veteran can tell you, years of pushing at a breakneck pace with an insatiable audience can be draining. That he diversified is a smart personal business strategy. So what of the five years between the $60 million cover and the similarly bold headline of "RIP Digg"? Same people. Same Web site. (Give or take) But a much different story. Of note, this blog has been running for more than five years, so I can go back to my own reaction to the original story when it broke in August of 2006. At the time, in an article titled, "Digg The Man a Pit To Hide His $60 Million", I picked apart BusinessWeek's assumptions of Digg's valuation, Rose's liquidity and how Rose had become the posterboy for the Web 2.0 movement. I added, "Digg, scarcely known a year ago, in the shadows of Web giants like Slashdot and CNet, has developed organically to be a real kingmaker for all media... But Kevin's not worth $60 million yet. He has a lot of work to do yet to achieve what is a tremendous potential." What happened after 2006? Twitter launched and Facebook opened up beyond colleges. With Digg seemingly run by an elite group of early adopters who could reach the front page with ease, the common Web user found faster venues to reach many at once, while stories reaching the front page of Digg would take hours. The site seemingly became as hyped for its ability to drive traffic downstream as to provide real value to Web visitors. By 2008, in an article titled "On the Web, If You're Not Growing, You're Dying", I showed how Digg was in a rut after hitting a peak in 2007, placing the site's traffic alongside other floaters, like Technorati and MySpace. Reaction to the initial BusinessWeek piece was varied, of course. Jason Calacanis complained that the users of Digg would not share from the financial windfall. Om Malik called the headline "Vapor". Meanwhile Steve Rubel compared the cover story to one of Marc Andreesen in Web 1.0 days. Of note, it's interesting that Om, Steve and Jason also are continuing to be visible five years later. So what else were we talking about back in August 2006? Issues with Microsoft Zune -- check. Topix -- practically invisible these days. The battle for Web privacy. Apple and Google shooting down rumors. Microsoft's Web strategy stumbling. Google launching Apps for your domain. 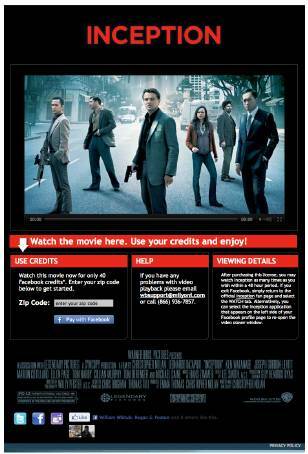 The entrenched retailers trying to stop Apple from adding movies to iTunes. Much of that era sounds familiar, but also quaint. Five years after the article, Slashdot scarcely comes up any more (though they can still push downstream traffic). Reddit and Hacker News are the hip news submission sites for geeks. Twitter and Facebook are dominant, worth billions. Topix and Technorati are floaters. The time for Digg to make it big seems to have passed, and the only great reason Kevin would have had to stay would be sheer loyalty or inertia. But the Web moves too fast to stay still, and it's obvious the future held more promise than the past, and it was time for him to move. Five years down the road, I expect this blog to still be publishing. It's probable that Om and Jason and Steve will still be prominent commentators as well. But how we perceive Kevin could be dramatically changed - be it through the value of his next idea or wherever he may pivot next. But think about the other startups out there that have seen well more than their 5th birthday. Are they fading to black or are they ready to lead? Time takes its toll. 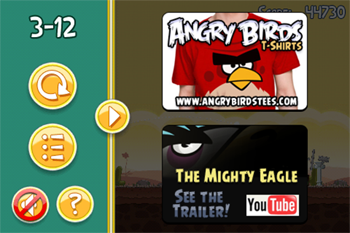 Finicky iOS Users Rebelling Over Rovio's Angry Birds "Ads"
Mobile app downloaders have come to expect a lot from their apps. iOS reviewers on Apple's iPhone, iPod Touch and iPad platform are notorious for being among the harshest raters across the app store landscape - as likely to drop a single star rating as a glowing five start mark, and practically demanding that advertising be limited to free apps. A point upgrade today to the seemingly invincible Angry Birds franchise from Rovio has iOS reviewers up in arms, thanks to in-game house ads that tout other extensions of the brand, from stuffed toys to begging for Facebook likes and YouTube views. The result, the practically permanent high flier has crashed down in a fluff of feathers with a deluge of one-star rants. As Angry Birds all too excitedly notes in the latest revision of the game, the average rating on the iTunes Store for the app was 4.78 stars out of 5. Users love flicking birds at pigs. It's a given. But with version 1.5.3, the 99 cent app brought ads that appear when the game is paused - just as on the Android platform - and this alone has dropped the franchise into hater territory. The current version is bumping along at an average of 3 stars, rising with each upvote and dropping with each slam, and the stream of comments is mercilessly opposed to this new tactic. "Ads should never be in a paid version of anything. Way to alienate your huge fanbase rovio. Greedy is what it is", writes Dana Levitt in her one-star review. 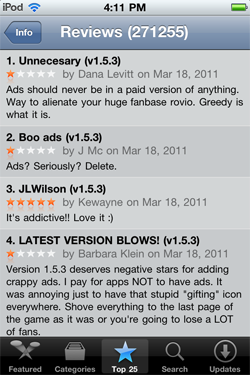 "Version 1.5.3 deserves negative stars for adding grappy adds. 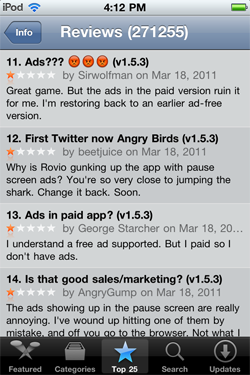 I pay for apps NOT to have ads." piles on Barbara Klein in her one-star missive. "... I (like others) am incensed at the barrage of ads when you pause the game," says MadDownpour. There are many more just like this (as you can see on the iTunes page hosted by Apple). The one-star ratings for the previously beloved game are plentiful, and the reasoning seems pretty straight forward. Users believe that if they have paid good money, even if it's 99 cents, they deserve to go ad-free, no matter what type of ads those are. Given Rovio is soaring right now, with talk of an IPO, the movie tie-in with Rio, and months in the spotlight, it'll be surprising to see if they are tarnished by ticking off this excitable user base. 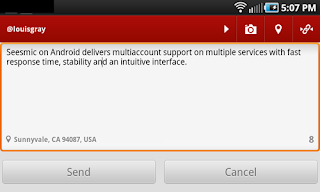 As for us on Android? The banner ads are a pain, but you're not charging, so I think we can deal with it.